This is the last of a 4-part series describing what I was intending to say to a live audience at the Publishers Association in London on April 28. In Part 1, I tried to make clear that a lot can happen in 20 years, which is the prediction arc for the first three posts. In Part 2, I described what I think is the world of information that will include publishing in 20 years. In Part 3, I suggest what I think publishers will evolve to and make some suggestions about how to get from where we are to where we’re going. And now, in Part 4, I take a shorter view, looking at the changes we can expect to see in the next two or three years. Now let’s think about the pretty immediate future. The year-on-year growth of ebook sales as charted by the IDPF shows overall sales volume growing by more than 2 or 3 times over the same period in the previous year and accelerating. Squinting at the chart, it looks to me like wholesale volume in the fourth quarter of 2007 was about $7 million, in the fourth quarter of 2008 the sales were about $16 million (2+x over last year), and in the fourth quarter of 2009 they were about $55 million (3+x over last year, about 8x over two years ago). Anecdotal reports say that for new narrative books, ebook sales are already in high single or low double digit percentages of the total number of units the book sells. You have to figure that the percentage growth on a per-title basis is less than the overall number for industry growth. 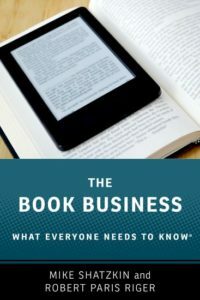 The overall sales growth is partly attributable to more and more titles being made available as ebooks, so the expectations for unit growth for an individual title wouldn’t be quite as fast. If ebook sales for new titles now are 7.5%, which seems like a low-but-reasonable estimate, and if that number doubles annually, which also seems conservative, we’d expect the ebook percentage to be 15% a year from now and 30% two years from now. In that light, a forecast of 25% ebook sales for new narrative books published by the end of 2012 (a bit over two-and-a-half years from now, and not to be confused with saying 25% of dollar sales volume will be produced by ebooks by then) is actually pretty restrained. The volume of print book units sold online is likely to be a similar number to the number of ebooks by then. That means that by the end of 2012, the expectation would be that fully half of the unit sales in the US for a new narrative title will be rung up online. Online sales not only require almost no sales force, no warehouse, and no complex support apparatus to achieve (that is: the services normally offered as “sales and distribution”), they also really require no inventory. Print books ordered online can be printed on demand. Making this forecast even more likely to be valid is the trend of diminishing sales in brick-and-mortar stores. Both major chains have reported substantially lower same store sales, year on year, for the past two years. Like the growth in ebook sales, this is a trend which it is hard to see changing over the next few years. Or ever, if the 20 year view we contemplated in an earlier piece in this series pans out. There are a number of obvious implications of the situation we see unfolding if this fairly short term analysis proves correct. Authors will be more inclined to self-publish, particulary their out-of print backlist and any title a publisher doesn’t offer an advance reflecting high expectations. That means that, on average, desireable books will be harder and more expensive for publishers to sign. The pressure for publishers to give more than a 25% ebook royalty will intensify. There will be excess capacity throughout the print supply chain: printing, warehousing, and sales operations, and the price of distribution services on offer will go down because the overhead cost of maintaining it, as a percentage of the sales it supports, will have gone up for those with fixed operations. Because the whole motivation for this lengthy multi-part post was to address the publishers in London, I want to close with a thought about a re-think that should be taking place among British publishers and agents over the next few years. In general, it is true that the Web diminishes the value of “local”. Part of the reason that bookstores are so challenged is that the customer around the corner from them who wants to shop online finds Amazon.com or BN.com just as “close” as their local store. On the other hand, the Web opens up a potential global market to anybody connected with it. For the past decade or more, the UK publishers have, in the stated interests of defending their territorial rights in their own home market, tried to bring English-language rights for Europe, which for years was ceded as “open” to books from the US or UK, into their exclusive grant of rights. The stated justification for this has been that the rules of the European Union allow any wholesaler in Holland or France to ship books into Britain and, if they bought from US sources, US editions could find their way onto UK bookstore shelves. Ignoring for the moment the number of ocean miles, warehouse handlings, and individual company profits a book taking that route to the UK would have to pay for (making one wonder, “you can’t compete with that?”), the wisdom of building high territorial walls might very shortly be called into question. For if a British publisher has an inside track to a British writer or a British-told story that has global appeal; and if the marketing for that book is mainly going to take place online through niche communities on the Web that are often geo-neutral but are certainly accessible from anywhere at no particular cost whether they are or not; then a British publisher can reach half the US market for that author with no inventory risk at all. Furthermore, territorial disputes between English-language publishers about ebook rights are making total global sales coverage increasingly problematical. The blogosphere is full of stories about people who can’t download an English-language book in Peru or Greece because the rights situation is ambiguous. Having one global publisher will assure total worldwide availability in a way that rights-dealing is making increasingly difficult. Agents will understand that. So I’d bet that a number of British publishers will, over the next few years, find the defense of territoriality a rear-guard and retrograde reaction to the new realities. In fact, aggressively selling the books you publish throughout the world, is not only possible but the most profitable and author-friendly way to navigate the next, and (from the long historical perspective) one of the last, twists of the book market.